A complete ban on the sale of cosmetics developed through animal testing has taken effect in the EU. The ban applies to all new cosmetics and their ingredients sold in the EU, regardless of where in the world testing on animals was carried out. The 27 EU countries have had a ban on such tests in place since 2009. But the EU Commission is now asking the EU's trading partners to do the same. Animal rights lobbyists said EU officials had "listened to the people". The anti-vivisection group BUAV and the European Coalition to End Animal Experiments (ECEAE) said they had spent more than 20 years campaigning on the issue and had enlisted celebrities including Sir Paul McCartney, Morrissey and Sienna Miller to their cause. They congratulated the EU Commission for putting the ban into effect. But BUAV says many countries in the world still test on animals for cosmetics and the group is now pressing for a global ban. 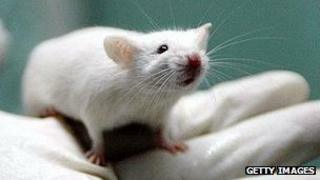 Mice and rats are used for more than half of all lab animal tests carried out in the EU. Despite the EU's 2009 ban, cosmetics firms were allowed to continue testing on animals for the most complex human health effects, such as toxicity which might lead to cancer. However, those tests now come under the ban too. The EU Commission says it is working with industry to develop more alternatives to animal testing, and that it allocated 238m euros (£208m; $310m) in 2007-2011 for such research. Cosmetics firms are concerned that the ban could put Europe at a competitive disadvantage in a global market. Cosmetics Europe chief Bertil Heerink, quoted by the Associated Press news agency, said that "by implementing the ban at this time, the European Union is jeopardising the industry's ability to innovate".